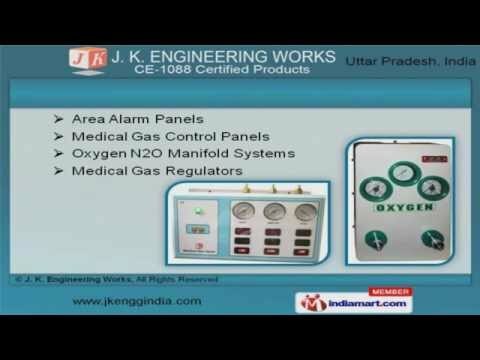 Welcome to J. K. Engineering Works.Manufacturer & Exporter of Medical Gases Pipeline System Equipments. Established in 1981, at Noida, we are an ISO 9001:2008, CE & NSIC CertifiedCompany. We Cater to Indian Subcontinent & East Europe. Cutting edge technology & competitive prices help us to serve Clientele like ApolloHospital & PD Hinduja Hospital. We offer a vast range of Gas Outlet Points, Bed Head Panels, OT & ICU Pendants. Our clients can avail from us an exquisite range of Single & Double Arm Pendants. We offer Area Alarm & Medical Gas Control Panel to the esteemed customers in variedtechnical specifications. Oxygen Flow Meters & Ward Suction Units offered by us are extremely reliable. We are engaged in offering superior quality Scrub Sinks & Nurse Call Systems. Along with that we offer Operation Theater & ICU Bridges that are a class apart.